Sarah here. As you may or may not know (depending on how closely you took a look at our new headshot pictures) we welcomed our second baby at the end of February. Throughout the pregnancy, my husband and I were filled with excitement, anticipation and a dash of anxiety if I am honest. Mostly, we felt ready to meet new baby boy! Because we were having another boy, we needed very little in the way of baby gear this go around, but there were still a few items that I added to my new baby wishlist. 1. A DockATot. Have you guys seen this magical sleep contraption? I am big into reading reviews and everything that I have read seems to indicate that magical sleepy dust is sewn right into the fabric. I could not wait to get my hands on one of these for snuggling the new little in bed or keeping him protected from overeager, toddler hands. So far, it is a big win in this house. 2. Natursutten pacifiers. We are going to give these a go this time around. I like that they are made from all natural rubber and basically take up half of a newborn baby's face. What could be cuter? 3. An heirloom blanket from Willaby. I have to admit that I have coveted these for quite some time. For this new little, I chose the goldenrod. It is beautifully soft and well-made. And! It is made in Athens, Georgia where our studio is located. I always love supporting local brands and this one is top notch. 4. Ollie Swaddle. We tried lots of different swaddles with my first and I was excited to add this one to the mix. Plus, who doesn't love a tiny baby wrapped up like a burrito? So far, new baby only likes having his hands where he can see them. I just wrap it around his chest under his arms to make him feel nice and snug. 5. Wildbird Sling. I've been told by countless friends that baby wearing is life changing with the second. I wore my first using a wrap and carrier, but I am trying my hand with this sling this time around. I chose Mallard with gold rings and it is beautiful. Baby falls asleep every time I put him in and I have two free hands to wrangle an energetic toddler. Cheers! And! You know I already have the Helmsie hunting print up in the new nursery. 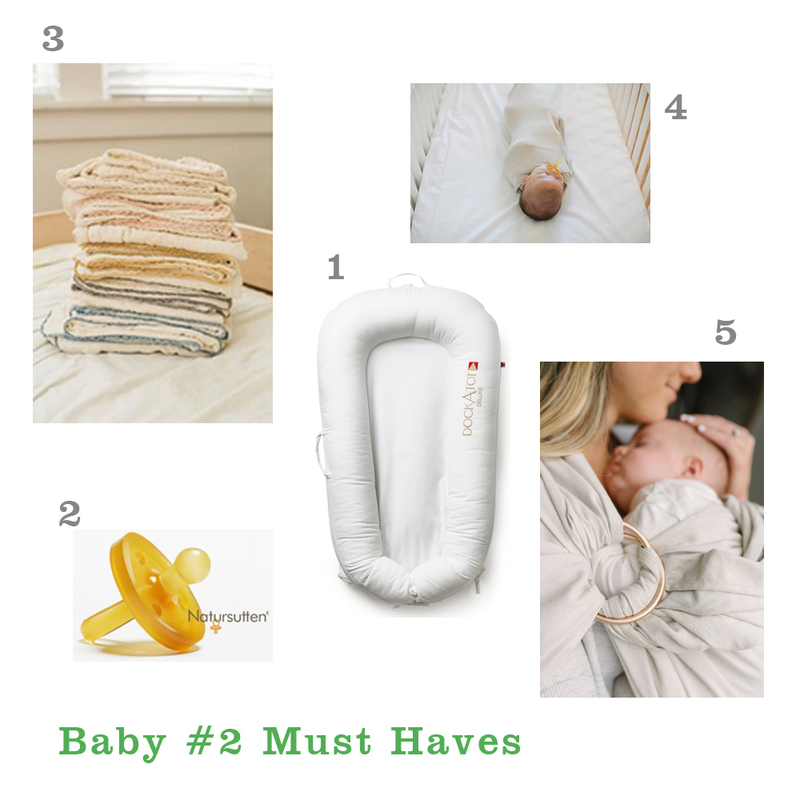 What were your first or second or seventh (bless you) baby must haves?